Morne Trois Pitons is located 13 km east of the town of Roseau in the highlands of south-central Dominica and it is the basaltic spike-like remains of a former volcano rising to approximately 1,300 m, within 8 km of the sea. The landscape is characterized by volcanic piles with precipitous slopes, and deeply incised valleys (glacis slopes). 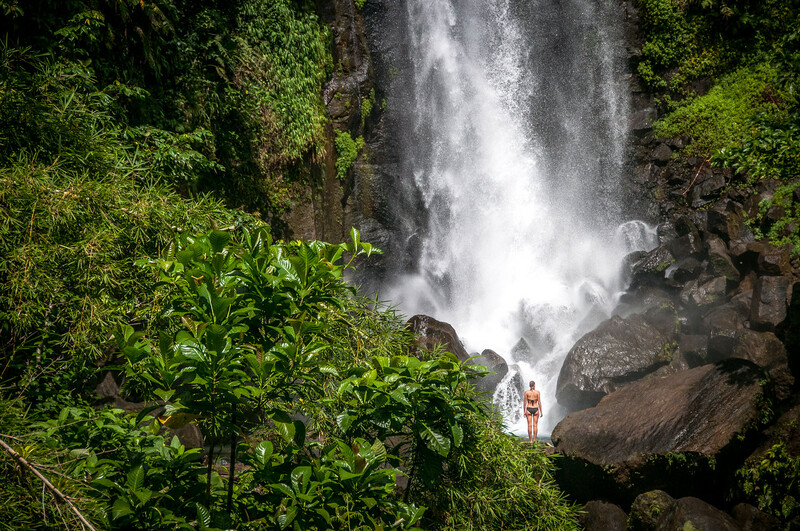 There is also a fumarole known as Valley of Desolation (or Grand Soufriere), with fumaroles, hot springs, mud pots, sulfur vents and the Boiling Lake, which is the world’s second largest of its kind. The valley is a large amphitheater surrounded by mountains and consisting of at least three separate craters where steam vents, small ponds, and hot springs bubble up through the ground. Boiling Lake is surrounded by cliffs and is almost always covered by clouds of steam. The Valley of Desolation drains into the Pointe Mulatre River, which flows into the Atlantic. Other outstanding features in the area include the Emerald Pool, fed by the Middleham Falls; Stinking Hole, a lava tube in the middle of the forest; and the Boeri and Freshwater lakes. 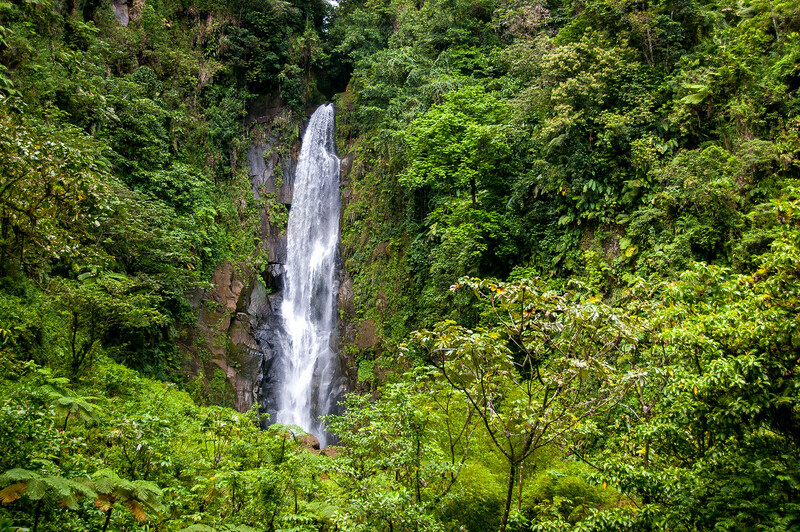 The Freshwater Lake is the largest and second deepest of Dominica’s four freshwater lakes. The Boeri Lake is the second largest in Dominica and is located in the crater of an extinct volcano. Both lakes are separated from each other by Morne Macaque (1,221 m) and vary in depth with the season. Both are thought to have originated some 25,000-30,000 years ago. The park also encompasses almost all the headwaters of the streams and rivers in the southern half of the island. Morne Trois Pitons National Park is the jewel of an island which itself might be the jewel of the Caribbean. 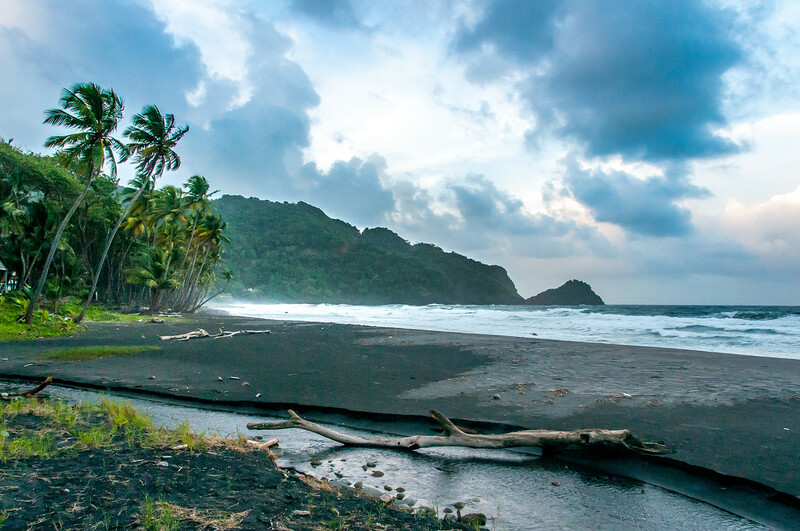 Dominica is a wild island that is still volcanically active. There are few beaches on the island, but the lack of beaches are made up for by 365 rivers, many mountains, the world second largest boiling lake and stunning lush scenery. Many parts of the part are only accessible by hiking. Some spots, like the boiling lake, require a full days hike to get there and back. The waterfall in the photo is Upper Trafalgar falls which is right next to Lower Trafalgar falls. Despite being right next to each other, the falls from rivers with completely different sources. 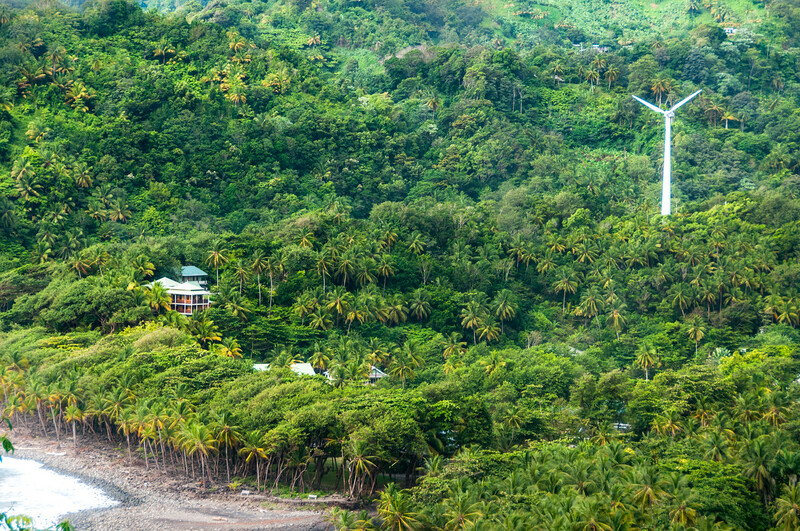 Dominica is the least visited country in the Western Hemisphere because the airport cannot handle large airplanes, but that shouldn’t deter you from visiting. It is unlike any other island in the Caribbean. The Morne Trois Pitons National Park is a natural UNESCO World Heritage Site in Dominica. It was inscribed on the UNESCO list in 1997 during the 21st session. This UNESCO site was established as a park in 1975 and spans a total of 17,000 acres in land area. This park covers the 4,672 feet-high three-peaked dormant volcano, Morne Trois Pitons, to which the park was named after. There are also several other volcanoes that are located within the park premises such as Morne Watt, Morne Anglais, and Morne Micotrin. Aside from its recognition as a UNESCO site, the Morne Trois Pitons National Park was also the first park to be established in the country. The Morne Trois Pitons National Park is an area known for its significant volcanic activity. The fact that the highest mountain in Dominica is located here, and there are a few others volcanoes too, can explain that. The volcanic activity within and near the park premises has also resulted in several amazing natural formations and phenomena. Aside from the Morne Trois Pitons volcano, the Valley of Desolation is one of the highlights of the park. This valley serves as a region consisting of small geysers and boiling mud ponds. The Boiling Lake is part of the UNESCO site Morne Trois Pitons National Park. It is a flooded fumarole that is made up of bubbling greyish blue water that is covered by a cloud of vapor. The lake itself measures around 200-250 feet across. The lake was initially discovered in 1870 and has since been closely studied as an important geological feature in the area. The lake sits on a sinkhole-like basin and is surrounded by high rock walls. 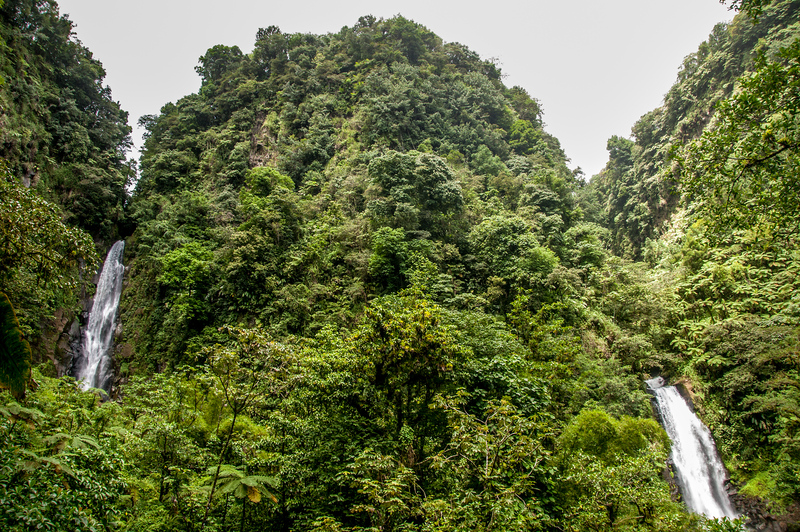 Titou Gorge is another important feature within the Morne Trois Pitons National Park. The term literally translates to “Little Throat”. This feature was formed due to volcanic lava flooding this area and splitting it open to form a natural cave. Beneath the gorge, there is a swimming area, which is like a natural pool. The Emerald Pool in Morne Trois Pitons National Park is part of a nature trail. This pool is located at the base of the pool within the park, which is one of the most photographed parts of the park. This is a 40-feet waterfall grotto and is accessible after about half-hour hike. 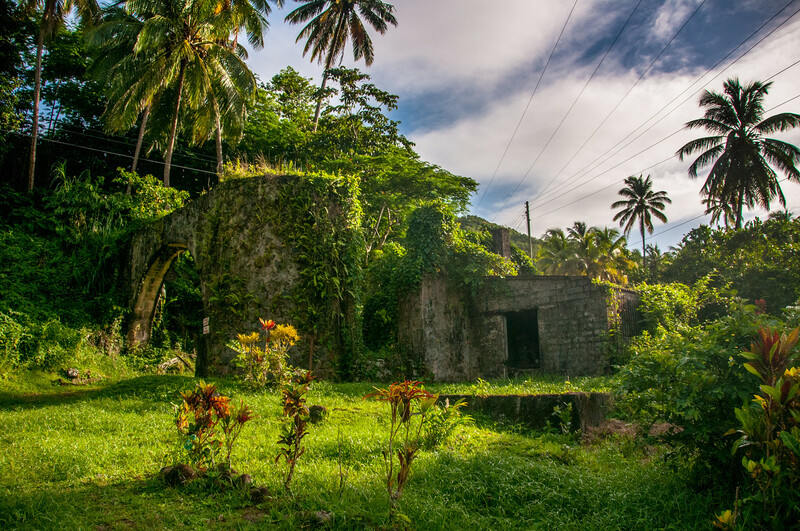 Visit my complete list of UNESCO World Heritage Sites in Dominica. Spectacular! 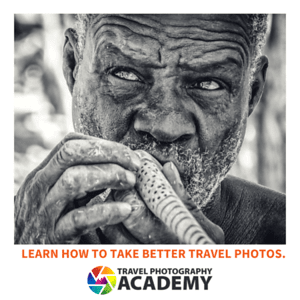 We are looking forward to seeing it in person in six weeks when our Caribbean trip takes us to Dominica.